Annual flowers can be described as those which complete their entire life cycle within one year. What this means is that they will sprout from seed to plant, mature, flower, propagate and then die all within or close to a single year. When planting a garden, one thing to keep in mind is that annual flowers must be replaced on a yearly basis, and that they will not re-grow like their perennial cousins. It is possible to extend the lifespan of annual flowers beyond the one year point by preventing them from seeding, but this is an advanced technique best left to experienced gardeners and botanists. Fortunately, most annual flowers are extremely affordable when purchased from a garden center, meaning that their yearly loss will not be a burden to you financially. Annuals tend to flower in the spring and summertime, and are hardier than perennials. This results in a longer blooming season, and thus more time spent making your garden look nice. Annual flowers scattered throughout or dominating your garden will allow you to enjoy fresh and vibrant colors for as long as possible, and will make your garden the envy of your friends and neighbors. Most domestic crop plants, which are those plants grown for consumption or conversion into food, belong to the annual family. Some common examples include grains, corn, beans and peas. These must all be re-planted each year, and are perfect for crop rotation strategies. A plant that requires replacement allows for fields to remain fallow or switched to another crop with great ease. Begonias are annual flowers of tropical origin, and technically classified as herbs or under-shrubs (meaning that they commonly grow under and around larger shrubberies). Because of their attractive and showy flowers of white, pink, scarlet and yellow, many species and countless hybrids are cultivated. The genus is unusual in that species throughout the genus, even those coming from different continents, can frequently be cross-bred with each other, and this has led to an enormous number of hybrids. This means that a large variety is at your disposal for gardening. 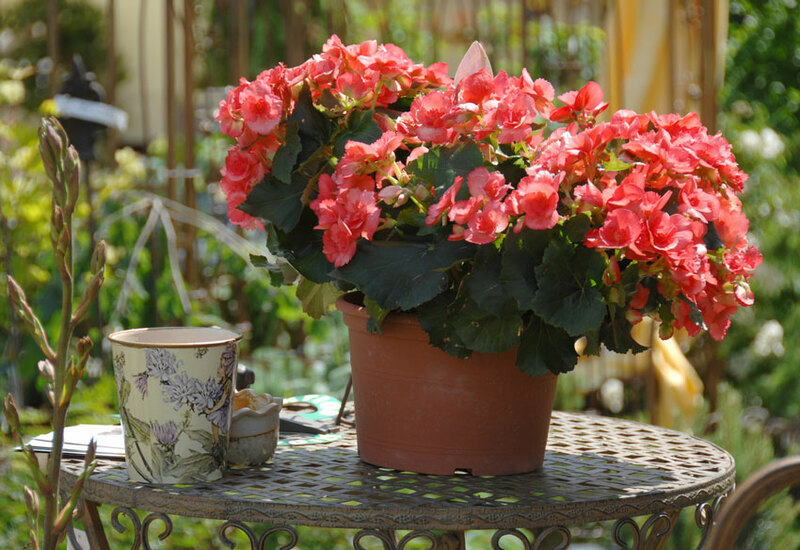 In fact, you could successfully plant a garden featuring only begonias of varying type. Impatiens are annual flowers found all over the world. The only place where they are not found is South America. Some species of impatiens are actually perennials, and flower for multiple years. The plant derives its scientific name Impatiens and the common name "touch-me-not" from the plant's seed pods. When the seed pods mature, they explode when touched, sending seeds several meters away. This is a highly evolved means of propagation, and ensures that the largest number of seeds possible will have the potential to mature into flowers. Marigolds are annual flowers that are common in gardens across Europe and North America. They are even classified as natural weeds in some parts of Africa and Oceania. They generally have flowers colored red, gold, orange, yellow and white that release a pungent aroma. This aroma is effective in keeping away some pest insects, and so the marigold is popular as a row plant that acts as a guardian to other flowers susceptible to consumption. Snapdragons are a large family of attractive annual flowers that include many varieties found in both Europe and North America. They derived their name from the resemblance their flowers share with the head of mythological dragons. They are best planted in well-drained soil to keep the roots from rotting. When combined with other annual flowers, they create a very attractive presentation and delivery, and one that will be envied by neighbors. Annual flowers make a great addition to your home garden. They are cheap, attractive, and come in a staggering number of varieties. These little gifts of nature will allow you to develop a garden to your liking, as pretty much every possible combination of size, shape and color is available. The best places to inquire about annual flowers are local garden centers, where you can acquire plants of all varieties, and your local florist, who will often sell seed packets. Mixing these with perennial plants is a long tradition in gardening and can lead to some truly remarkable combinations. You will enjoy the results of your hard work when you're able to sit outside in the summer sun soaking in the fragrance and color of your beautiful garden.